ASHA, the national organization responsible for certifying Speech-Language Pathologists and Audiologists, is charged with ensuring that all people with speech, language, and hearing disorders have access to quality services. CASANA provides resources and information on pediatric verbal apraxia. 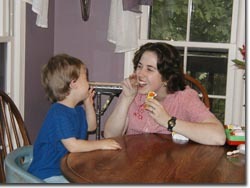 This website provides information on the PROMPT technique used with children with apraxia. ASA provides information and support to individuals with autism spectrum disorders and their families. This is a website that teaches sign language. Sign language is frequently used for both children who have hearing impairments and children who have limited spoken language to enable them to express themselves. This is a great site providing phonics activities and stories for reinforcing phonemic awareness. AOTA is the national organization that represents the concerns and interests of occupational therapy practitioners to improve the quality of occupational therapy services. AOTA’s major programs and activities are aimed at assuring the quality of occupational therapy services, improving consumer access to healthcare services, and promoting the professional development of practitioners. The Sensory Processing Disorder Foundation offers research, education and advocacy. In addition, SPD Foundation offers an abundance of programs for professionals, parents, and anyone interested in knowing more about the sensory challenges that affect children academically, socially, or emotionally. International non-profit organization dedicated to disseminating information and about the causes and interventions for developmental delay. Provides activity ideas and printable worksheets to promote fine motor development for preschool aged children. Allows parents to customize handwriting worksheets for practice with both manuscript and cursive writing.